Hello everyone! I've recently started doing some pediatric telephone triage from home. My background is NICU nursing where I still currently work PT. I do have some experience in pediatric nursing but its been awhile and it was a specialty outpatient clinic so not general peds. So far I really like the job but figuring out what protocol can be a little challenging. I know it will get better with time, but my question is does anyone know of any practice call/scenarios that use the Barton Schmitt protocols that I can practice on? The company I work for did have some, but I would love to do more. It was very helpful. Any other advice from anyone doing pediatric telephone triage? I've also posted in the telephone triage nursing board but it tends to be slow over there so wanted to post here as well for more traffic. Thanks! Hello everyone! I've recently started doing some pediatric telephone triage from home. My background is NICU nursing where I still currently work PT. I do have some experience in pediatric nursing but its been awhile and it was a specialty outpatient clinic so not general peds. So far I really like the job but figuring out what protocol can be a little challenging. I know it will get better with time, but my question is does anyone know of any practice call/scenarios that use the Barton Schmitt protocols that I can practice on? The company I work for did have some, but I would love to do more. It was very helpful. Any other advice from anyone doing pediatric telephone triage? Thanks! When I first saw this story I thought there is no way this can be real but unfortunately it is. I'm sorry but this situation is just wrong. I first want to say that I am all for people having large families and I personally don't care how the children our conceived. That's not my business. Who am I to judge, BUT this situation is completely ridiculous. She already has 13 children. She decided to try for another because her 9 year old wanted a younger sibling. Are you kidding me? I am just shocked that a doctor agreed to this. I know that many fertility clinics have age cut offs. Obviously this doctor didn't seem to care. I'm sure her intention was only to get pregnant with 1 baby. I'm sure she was shocked to find out there was 4. Even a singleton pregnancy is risky for someone at the age of 65. I can't believe she would take that risk. I kinda of lost respect for her when I read this: "Raunigk, who lives in Berlin but plans to move to a town in North Rhine-Westphalia to be closer to some of her other children before the birth, will hope to finance her children's upbringing through media coverage and sponsorship deals." As a NICU nurse I am very aware of the risks of a quadruplet pregnancy. I will be hoping that her body can carry these babies as long as possible for the sake of the babies. I will definitely be following this story. Love this thread! I was born in 73. I remember: Prank calling while at a slumber parties. You could do it then since there was no caller ID. Ding dong ditch (ringing people's doorbells and running). Sneaking out. Watching MTV ALL DAY during the summer. Playing outside all day and coming home when it was time for dinner. We would go all over the neighborhood. Walk to 7-11. When I lived in apartment complexes I remember "dumpster diving." Jude Blume books. Remember SuperFudge? People smoking EVERYWHERE. I grew up with just my Mom and she was a heavy smoker. I'm sure I smelled like smoke. In elementary school I remember everyone making ashtrays for their parents. Jean jackets with patches all over them. Talent shows in elementary school. I remember doing She's a Maniac from Flashdance in the 5th or 6th grade. Riding in the back of pickup trucks. Riding in the front with no seatbelts. Looking forward to getting the TV guide in the Sunday paper and seeing what was on the following week. Watching Saturday morning cartoons. Remember being able to watch TV with my Mom in the evenings. The shows were mostly family friendly. Loved Laverne & Shirley, Happy Days, Who's the Boss, Growing Pains, Family Ties, Eight is Enough, etc.... I remember seeing E.T. in the theatre. Wearing "cutoff shirts." My brother would cut off the sleeves on his shirts (muscle shirts). My Mom had a large stereo console that played records and 8-tracks. I remember her Donna Summer 8-tracks. Getting a busy signal when calling your friends. I remember the phones hooked to the wall. I remember my Mom would snap my fingers at me if I wasn't being quiet while she was on the phone. I remember cordless phones were a big deal as well as call waiting and answering machines. Walkmans and jamboxes. I remember making "mix" tapes. Perms. I really wanted a "spiral" perm, but my perms never turned out good. My first famous crush was Michael Jackson. I LOVED him. I had a Michael Jackson notebook, wallet, pins, etc..... I remember trading Duran Duran pictures for Michael Jackson pictures in the 5th grade. I was a huge 80's rock fan. Loved the hair bands and going to concerts. Loved Stryper, Queensryche, Def Leppard, Dokken, Scorpions, Metallica, and many, many more. I could keep going on and on. It amazes me how much time has gone by and how fast it has gone. Just curious to see if ya'll have heard about the revising of the levels of care and what your thoughts are on this. I think we can all agree on what Level I and Level IV entail, but Level II and Level III can get a little "gray" and it looks like this is where most of the revisions will be. There is such a wide spectrum on what Level III's can do. I think it can be misleading when Mom's see that where they plan to deliver has a "Level III" NICU and she assumes that they can handle just about anything which we know isn't necessarily true. I've heard with these revisions that it will be harder to obtain Level III status. Thoughts? It just amazes me that despite all that money going towards breast cancer there is still no cure. Yes, survival for some types of breast cancer has increased a lot and that is GREAT, but I think the focus needs to shift to "race for a cause" instead of "race for a cure." Let's face it cancer treatments are rough and without significant risks. I think breast cancer has received all the attention due to creative, persistent, and aggressive marketing. I do wish all cancers got all the same funding because they are all devastating. As I get older cancer is a very real fear for me. I just want to know what the heck is causing all this cancer. It's just scary! It's a shame that we have hospitals just for cancer. Something is very wrong! There are 2 hospitals in Denton. They are medium size community hospitals. One of them is Presby Denton which is part of Texas Health Resources (THR) which is a non-profit and operates several hospitals in the Dallas/Ft. Worth area. The 2nd hospital is Denton Regional which is for profit and is part of HCA which also operartes several hospitals in the Dallas/Ft. Worth area. For the most part THR has a better reputation in the Dallas/Ft. Worth area, but I definitely would look into Denton Regional as well. The market is tough for nurses in the area, but I think with your experience you shouldn't have too much of a problem. Here are the links for the 2 hospitals. Texas Health Presbyterian Hospital Denton | Denton, TX http://dentonregional.com/ If those don't work out there are a ton of hospitals in the Dallas/Ft. Worth area to look into. Agree with everyone! My biggest pet peeve as Tiffy mentioned is disorder. The clutter drives me nuts. Messy bedside carts and especially cluttered beds. The bed may not necessarily be dirty, but there will be a ton of blankets, developmental items, etc... I like my beds simple and neat. They don't need 20 million blankets in there. That does seem unfair to me. At my hospital PRN, PT, then FT gets cancelled in that order and it goes by turn. We also have a list of people that are requesting "EO" so they would get cancelled 1st, but the problem with that is even if you get your "EO" you are still required to take call. It seems like a waste of PTO to me. Some people would try to use an "EO" day instead of calling in sick so it wouldn't be used against them. We have a strict call in policy. The problem with that is if we get busy you could get called in so you are taking a chance, so if you are truly sick you better just call in sick. Also if PRN gets cancelled they aren't required to take call, but they can if they want to. Wow. I'm surprised that such a high level NICU wouldn't follow best developmental practices. I would start with the manager and/or educator and see what they think. 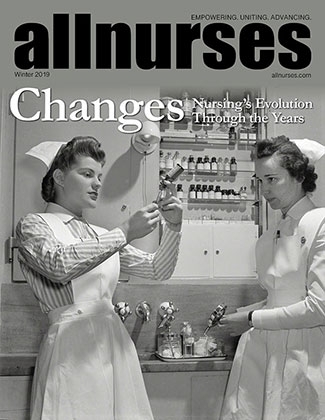 I agree that too much change at once would probably get a lot of push back from the nurses. I would make a list of all the problems/issues that you see and prioritize them and just start working your way down the list very slowly. Initially I would only address 1 or 2 things. Maybe the manager and/or educator could get an expert to come do an inservice/presentation on the importance of developmental care in the NICU. Do you have PT/OT/ST services available to the NICU? They should be able to help you as well.Good for you for recognizing this problem and taking initiative!Good luck! Well it depends on what you are passionate about. Are you drawn to 1 particular area more than the other? Is this an area you have wanted to go into before? When I was in nursing school I was only interested in kids or babies. I pretty much had no interest in adult care. I was lucky enough to be able to go straight into the NICU and have had no regrets. There are some similarities between these areas but there are several differences as well. Here is a breakdown. Remember I have only worked NICU. I have no experience in the PICU. 1) The PICU has a very wide range of ages. Anywhere from newborn to age 18 and it isn't uncommon for some PICU's to have patients older than 18. Usually the "adults" in the PICU have a defect/disease common to children such as cystic fibrosis, congenital heart disease, etc... These kids are living much longer now and adult doctors really don't know what to do with them. 2) The PICU has a wider range of diagnoses. Depending on the type of PICU you are in you may see trauma patients, post surgery patients, and of course a wide variety of medical issues. In the PICU you will see a lot of kids with chronic illnesses that get admitted often. In the NICU you generally see the same type of diagnosis. LOTS of respiratory issues, but if you work in a large, high acuity NICU that does surgery you will see more variety. 3) The level of acuity varies between these units as well. Generally if a kid is in the PICU they are very sick and need the higher level of care. In the NICU not every baby is critically ill. Some babies are in the NICU just for a 48 hour rule out of sepsis and may just need antibiotics for 48 hours. A lot of babies are just a little premature and just need some time to grow and learn to feed. They really aren't "sick." Does that make sense? On the other hand you can have some very sick babies in the NICU. You could be taking care of a 1 pound baby on the oscillator with multiple drips. Also, those babies that don't seem "sick" can turn on you in an instant and become the sickest baby in the unit. Generally speaking though most of the babies in the NICU do pretty well. 4) There is tons of teaching in the NICU. Remember these babies haven't gone home yet so everything is new to mom and dad. Especially if they are 1st time parents. Throw in the fact that their baby is sick or premature and there is much more teaching that goes along with that. It may be as basic as teaching them how to change a diaper or it may be more complicated like teaching about the ventilator, trach care, etc.. In the PICU there will be a lot of teaching as well, but if the child has a chronic illness/disease the parents may be teaching you instead of the other way around. They know there child better than anyone else. Regardless, you will be dealing with the parents A LOT whether you are in NICU or PICU. I would suggest that you request to shadow in both of these units so you can get a feel for what may be a better fit for you. Regardless of which unit you picked you want to make sure you get an extensive orientation. Everything will be new and different. You will probably feel like a new grad again. You also need to consider what you can handle emotionally. I am a mom of 3 small kids so at this point in my life I don't think I could handle working in the PICU. Don't get me wrong the NICU can be very sad and heartbreaking, but I just don't think I could handle taking care of a 2 year old that was severely injured in a car accident or had a near drowning. I just think it would be too much for me. Also you have to put your judgments aside which can be hard. Think of the child in the PICU that was abused and is now neurologically devastated or the mother that just gave birth to her 8th child at 24 weeks and has a positive drug screen and she doesn't have custody of any of her children. There can be some very heartbreaking situations in both units. Also in the PICU you would likely encounter a lot of former NICU patients. If you are in a Children's hospital that has a NICU and a PICU you usually are required to float between the 2 units so that would give you experience in both. Hope that helps Good luck! As far as I know the baby with Legionnare's disease didn't make it. I have always found the genetic anomalies and syndromes very interesting and of course sad. I have always wondered why some hang on and make it to term rather than being naturally miscarried by the Mother. I find genetics very fascinating and complex. Yea, haven't heard of Trisomy 9. Interesting. Glad you were able to make a difference in her life Bortaz!